This week’s installment of the Global Research New Hour marks the fifth of a five part series highlighting research into the World Trade Center attacks and the need for a renewed investigation. From September 8 to September 11, 2011, a gathering of researchers, experts and activists converged on the campus of Ryerson University in Toronto to review what was then the most up to date information with regard to the ten-year-old tragedy. Throughout the four day event, speakers challenged the views that the attacks were carried out by an outside enemy and that they were successful because of US intelligence failures. The visiting speakers from around the world would point to evidence that the Twin Towers were deliberately brought down using explosives. They would discuss the term ‘conspiracy theory’ and the consequent attempts to marginalize critics of the official story in mainstream media and culture. Crucially, they would make the case for a re-opening of an independent investigation into the attacks. Before one can truly come to terms with the truth behind the September 2001 attacks, one must first overcome a lot of psychological resistance. Our perspective on events that we witness is shaped by the ideologies and pre-conceptions we carry with us. State Crimes Against Democracy (SCADs) as Laurie Manwell points out in her presentation at the Toronto Hearings, provide a profound challenge to our most closely guarded beliefs about government and democracy. As a result, the general public can react dismissively, even derisively, when confronted with alternative explanations of State crimes such as political assassinations and State Terrorism. Overcoming these psychological barriers therefore implies a thorough understanding of the role of media in reinforcing the narrative of State authorities. Much of the media coverage of the 2011 Toronto Hearings on 9/11 invoked the term ‘conspiracy theorists’ in relation to the academics, researchers and distinguished panelists who participated in the four day event. There was likewise the suggestion that holding the Hearings on the tenth anniversary of the attacks was in bad taste and disrespectful of the victims’ families. Mainstream media, in other words, performs a propaganda function in our society of normalizing State authority. Once such psychological resistance is overcome, through courageous assessment of the facts, as presented during this radio series and throughout this website, one must then find a practical mechanism for acting on that information. As retired US Senator Mike Gravel points out in his presentation at the Hearings, without practical actions, exposure of State crimes will do little more than generate another generation of dis-empowered cynics. The truth movement is more than an interesting academic diversion. It is an opportunity for citizens to come together and reclaim their power. As the world sits poised at the thresh-hold of a renewed Middle East conflict which could explode into a wider regional if not global conflagration, it is vital that foreign policy be determined and shaped by players other than those guided by commercial or elite interests. Kevin Ryan is a chemist and Laboratory Manager and was the site manager for Environmental Health Laboratories, a division of Underwriters Laboratories, before he was fired in 2004 for publicly questioning the report drafted by the National Institute on Standards and Technology (NIST) on their World Trade Center collapse investigation. He has continued to research the World Trade Center attacks and works as co-editor of the on-line Journal of 911 Studies. In his presentation on Day 3 of the Hearings, Ryan focuses on the evidence of much higher temperatures in the presence of the Trade Center debris than acknowledged in the NIST findings. Laurie Manwell is a PhD candidate in behavioural neuroscience and toxicology at the University of Guelph. She contributed to a special issue of the journal American Behavioural Scientist devoted to what are called ‘State Crimes Against Democracy’ and to psychological resistance to embracing alternative accounts of such events. This paper was the basis of her presentation on the final day of the Toronto Hearings. David Ray Griffin is a retired Professor of Philosophy of Religion and Theology from the Claremont School of Theology in Claremont, California. He has written or contributed to twelve books on the topic of the 9/11 attacks including his most recent – 9/11 Ten Years Later: When State Crimes Against Democracy Succeed. On the fourth and final day of the Hearings, Griffin spoke on the anomalies in Flights 77 and 93. Mike Gravel served as US Senator for Alaska from 1969 to 1981. He ran as a third party presidential candidate in 2008 and continues to champion progressive policies on global warming, taxation, health care, human rights and peacemaking. Senator Gravel spoke on Day 4 of the Hearings on the topic of the importance of resistance to State deception: The Pentagon Papers and 9/11 and the need for a new investigation. Bob McIlvaine is the father of Bobby McIlvaine, a Princeton University graduate who served as Assistant Vice-president of Media Relations for Merrill Lynch and perished the morning of September 11 while en route to a banking conference in the World Trade Center North tower. One of the most outspoken 9/11 Family members, Bob attended every 9/11 Commission hearing and has appeared in several 9/11 Truth conferences. 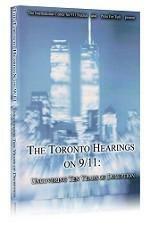 An over 5 hour DVD, with comprehensive coverage of the 4 day Toronto Hearings from September 2011. The Global Research News Hour, hosted by Michael Welch, airs on CKUW 95.9FM in Winnipeg Thursdays at 10am CDT. The programme is now broadcast weekly (Monday, 5-6pm ET) by the Progressive Radio Network in the US, and is available for download on the Global Research website.